Preheat oven to 375°F. In a small skillet, add butter over low heat. When melted, add the breadcrumbs, chili powder, garlic powder and a pinch of salt and pepper. Stir the breadcrumbs to distribute the butter and cook the breadcrumbs for 3-4 minutes, stirring regularly, until they are browned and crispy. Remove from heat. Slice chicken breasts lengthwise so you have four thin pieces. Add flour to a plate with a big pinch of salt and pepper. Whisk egg in a separate bowl. Dip chicken in flour mixture, then in egg, then finally in the crispy breadcrumbs. The chicken should be completely coated in breadcrumbs. Place coated chicken pieces on a baking sheet lined with parchment paper. Bake the chicken pieces at 375°F for 20-25 minutes, flipping once halfway through until they are cooked through. The interior temperature of the chicken should reach 170°F. Test the chicken before serving as cooking time can vary depending on thickness. To make the Dill Pickle Slaw: In a large bowl, stir together mayonnaise, dill pickle juice, mustard, apple cider vinegar, hot sauce, and a pinch of salt and pepper. Using a box grater, grate carrots and pickles. Stir cabbage, carrots, and pickles into the mayonnaise mixture. Stir well to combine and season with salt and pepper. Store in the fridge, covered, for up to 4 days. 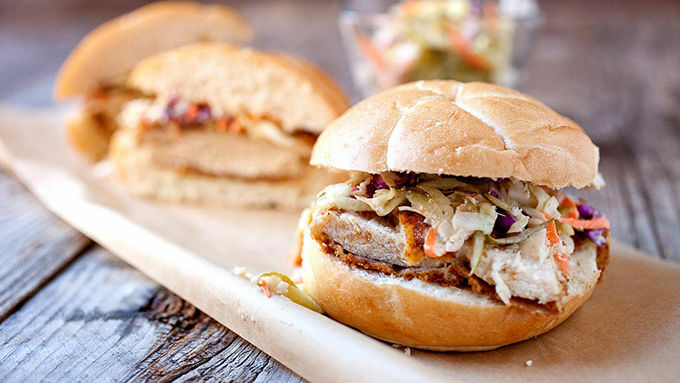 Serve baked crispy chicken pieces on toasted rolls with big spoonfuls of slaw. What if I told you that you can make deliciously crispy chicken sandwiches at home, but more importantly, you don’t need a fryer? 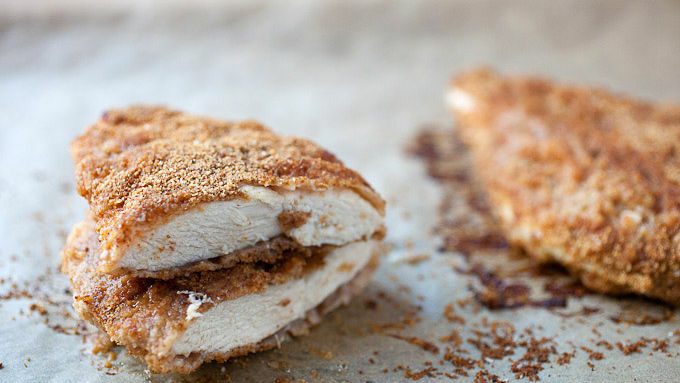 The trick to these baked chicken sandwiches is all in the breadcrumbs. 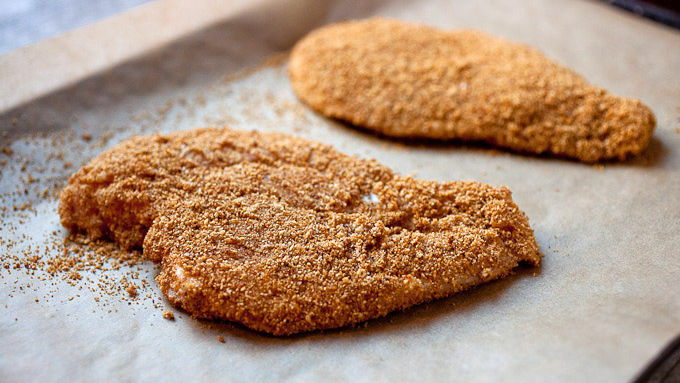 Instead of just coating the chicken with breadcrumbs, brown the breadcrumbs with some butter and seasonings in a small skillet first. 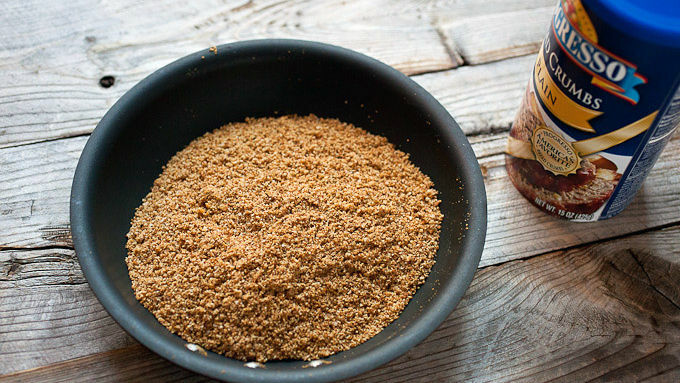 By cooking the breadcrumbs with a little butter over low heat, they get seasoned perfectly and turn crispy. So when you add them to the chicken later, it’ll be magical. I like to start with Progresso® plain breadcrumbs and then add in some chili powder, garlic powder, and salt and pepper! Okay. Let’s talk SLAW. These sandwiches need a topper and a good pickle slaw is perfect. I like to stir a little pickle juice into the mayo/mustard/vinegar dressing to up the pickle flavors a bit. Then I like to add in some actual grated pickle as well! The finished pickle slaw is good on the sandwich but also great as a side dish. Sandwich a piece of crispy chicken between a toasted bun and pile on the slaw. Such a good sandwich!